Planning a change isn’t always easy. Deciding to take that leap of faith truly starts the beginning of what often is a very scary journey. When you reach a point in your life where things just haven’t turned out the way you envisioned them, you find yourself being challenged to decide what type of person you really are. Will you choose to settle for what’s become comfortable and familiar? Or will be one of those few brave individuals who decides to make some very necessary changes? Ever sit in a restaurant and notice people around you dining alone? More often than not they are fiddling with their cell phones or laptops trying to make themselves look busy. Now some of these people may in fact be doing something productive, but we have to admit, some people really just appear to be uncomfortable being alone in public places. I was eating breakfast this morning and I noticed two women that inspired todays post. Both women were seated by the hostess and in a matter of minutes I noticed that they appeared uncomfortable having to engage in the simple act of just enjoying breakfast by themselves. While this one women pulled out her laptop and started stalking her friends on facebook, the other played with her iphone while she waited to be approached by her waiter. Are people really that uncomfortable just enjoying some alone time in a public place without the use of some technological device that assists them in looking busy? Sometimes it seems that the idea of being alone is not socially accepted. Although we wont admit it, how often do we judge people who travel alone, eat dinner alone, or attend a movie alone? It appears to me that we would much rather judge these individuals before admitting to ourselves that people who are alone in public truly makes us uncomfortable. Have we honestly reached a point where we have made people think its “bad” to be alone? We see it in movies all the time when the waiter comes up to the apparently sad patron dining alone and asks them “Will you be dining alone miss?” Why do we have to constantly send the message to people that they have to be in some type of group in order to be accepted by society? Are the inappropriate glances and smart comments we make towards these people really necessary? When you are comfortable in your own skin you are more capable of stepping away from the crowd and being an individual. You can enjoy a stroll in the park on a sunny day all by yourself, you can travel to Spain just because you have always wanted to, and you can watch a movie in a packed theater full of couples without thinking twice about that fact that you did this all these things alone. Taking sometime every so often to just be by yourself is completely healthy. If you can’t enjoy being alone with yourself then you really should take sometime to question where that’s coming from. “We’re born alone, we live alone, we die alone. Only through our love and friendship can we create the illusion for the moment that we’re not alone”. 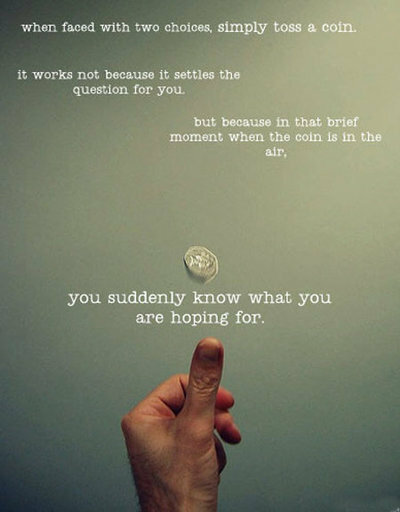 Do we really need a coin to tell us what it is we already know we want? Be confident in your pursuits, and the coin will always fall in your favor. Ever sit down and write a mental “To do” list for your life? Are you the type of person that maps out every expectation you have for yourself years in advance? Do you envision where you see yourself, who you see yourself with, and how successful you will be? Before you get too wrapped up in making sure you cross everything off of that list, think to yourself how much time is spent mapping out that perfect life while you neglect the one happening right in front of you. Is the strategic planning really worth the stress and aggravation when you are not guaranteed that desired outcome? Life’s too short to be preoccupied with those things we cannot completely control. Do your best, live day by day, and keep a positive outlook. Once you free your mind to think of the endless “possibilities” rather than the “definite” outcomes you want for yourself, you will begin to enjoy life to the fullest. Ever notice that the people enjoying themselves the most are those who aren’t worried about the strangers around them? Confident people are rarely preoccupied by the individuals outside of their immediate peer group. When you are confident you pay less attention to the outside variables that may cause you to have a negative reaction. You worry less about what other people are wearing, how they are acting, and you put more time into enjoying yourself. Taking time out to enjoy life and those whom you care about is what a confident person prefers to focus their attention on. Start your day off by looking in the mirror and smiling at the person in front of you. If you begin to worry less about what others think, and more about what you think of yourself, you start to notice a significant change in your environment. People will want to be around you, and you will begin to put more effort into being around positive confident people like yourself. Once you start feeling better about yourself you will begin to see that you are having more enjoyable experiences in your daily life. A confident person has the ability to capture an audience and be a leader. With confidence comes positive experiences and the potential to do big things. Stop worrying about everyone else and start focusing on you. Every two years you should take some time to reevaluate your life. Reflect on the goals you set out for yourself two years ago and see where you are today. Make changes where you find unhappiness or dissatisfaction. Whether it is in your job, your place of residence or in relationships with your peers, if you feel like you could be doing better, then pursue alternatives for happiness with conviction. Get to know yourself inside and out. If you find yourself stuck in life then it’s time to switch things up. Only you can control the outcome of your ambition. Whereas the average individuals “often have not the slightest idea of what they are, of what they want, of what their own opinions are,” self-actualizing individuals have “superior awareness of their own impulses, desires, opinions, and subjective reactions in general. As many of you already know, health and stress are very closely correlated. While we strive to be successful in all that we do its made all the more difficult when we have additional stress on our shoulders. Women today are constantly juggling a number of responsibilities during their daily lives. In a time where women are just as ambitious as men, we strive to have it all. The degrees, the well-paying job, the equally successful husband, children, and a comfortable home. In order to achieve this dream we sometimes tend to take on more than we can handle both mentally and physically. How can this effect our level of success in life? Most women today go to school, work full-time, and care for a family all in the hopes of one day achieving a higher level of success for themselves. The constant struggle to climb the ladder of success can be very stressful on a person. While it can have debilitating effects on your mind and body it can also impact your personal relationships. In a society that promotes going to the extra mile to achieve your goals how can we learn to balance our personal expectations and our overall quality of life? How does one continue to be productive in life without eventually burning out due to excessive amounts of stress? Here are some tips experts have found to be quite helpful. Please send comments if you would like to suggest other tips. LISTEN TO YOUR BODY: Identify the stresses that are manifested physically, mentally, and emotionally in your daily life. When in doubt make a list of all the things that currently cause you to experience stress. Prioritize your list and begin the process of de-stressing those things you know are in your control. DEVELOP HEALTHY EATING EXERCISE AND SLEEPING PATTERNS: Although this is a hard task to take on, its important to give yourself time during the week to engage in activities that increase your overall energy in a positive way. By incorporating healthy eating, exercise, and sleeping habits you will find that your overall functioning and productivity will increase. Start off slow but be sure to start. Everyone needs time to take care of themselves. START YOUR DAY OFF BY TAKING A MOMENT: Instead of jumping out of bed the moment you hear your alarm go off, why not take a moment to engage in a calming activity. Every morning I take my dog for a 10-15 minute walk around my neighborhood. I give myself this time to play out how my day will go. Take a few moments to think of how your day is going to turn out. Starting making your day go in the direction you want it to. Your day is determined by the way you start off your morning. KNOW WHEN ITS TIME TO MAKE A CHANGE: If joy no longer exists in your job, your relationships, or you find that someone of something is holding you back from experiencing good things in life, then you must make an attempt to alter your circumstances. “There is nothing wrong with change, if it is in the right direction.” Winston ChurchillThanks for reading.